P and I attend a large church. Our church has four services each weekend, one on Saturday night and three Sunday morning. I believe there are around 5,000 people who attend on a regular basis. As you can imagine with imagine with such a large church it is difficult to get to know people. One way our church leadership addressed the issue of people staying connected with each other is to encourage Mini Churches. For the past year we have hosted a Mini Church in our home every other Sunday evening. The reason we hosted it is because I know I can get into our house. I might not be able to get into other houses. The every other Sunday evening get together is a time for talking with each other, sharing experiences, high moments and low moments. 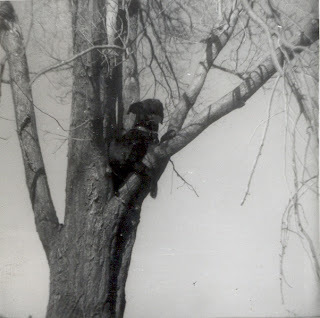 Some share grandchildren photos and stories. I am always ready to listen to the latest stories. Some share hair raising teenage children stories. I like those type of stories and have a large number concerning our children when they were teenagers. It's a friendly time of visiting and after the first hour of visiting we spend the second hour talking about a Biblical truth or concept. Currently R leads these discussions, however he wants to return to school. So P and I will be more involved by leading the discussions. When P and I learned that church was having a Mini Church leadership-training seminar we signed up. The seminar starts this evening and ends early tomorrow afternoon. It was to end Sunday afternoon, but too many of the people attending are also the people who volunteer to help at the Saturday evening and/or Sunday services. Seems as if, just like in most organizations that rely on volunteers, 20% of the group seem to do 80% of the work. Oh well what can one do. One nice thing about driving to Holland Michigan is you go past South Haven Michigan. Now in South Haven there is an Ice Cream store that in my opinion has some of the best ice cream. Hopefully they haven't closed for the year because I would love to have some Sherman's Ice Cream. I just returned form my doctor and the pseudomonas is gone. So all the weeks and weeks of antibiotics did their work. However, I now have a yeast infection in my throat. Now the doctor must decide how to treat this new issue. Oh well at least I did the 5K last weekend. Well I can cross off one more item on the list of things to do. 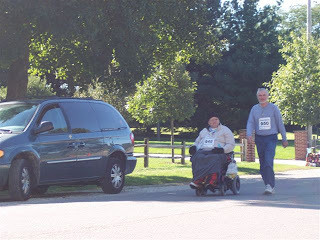 I have now taken part in a 5K-run/walk. 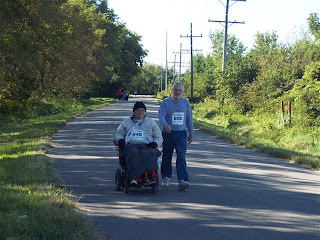 Saturday September 15 my older brother, younger sister, niece and her husband participated in the Harvest Hammer 5K-Run/21K-Bike event. At 9 AM the 5K-Run/Walk began. My sister, niece and her husband ran. My brother and I walked. I was so cold. When I was in a manual wheelchair I would create body heat by pushing the chair. Now I can no longer manage a manual wheelchair, so have an electric chair. 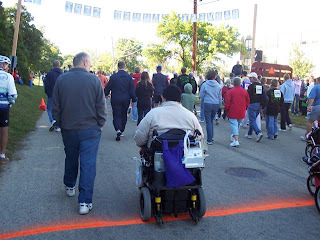 Using an electric wheelchair does not cause your body to generate any heat. So I wore a heavy shirt, lap blanket, hat and gloves. When my brother took his jacket off, I offered to carry it over my legs. If you click on the photo you will see I am quite the fashion statement. D and I crossed the finish line 54 minutes after starting. I can't tell you how glad I am to have finally done a 5K. 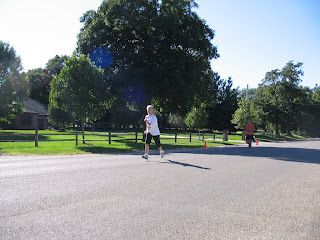 I must mention that my sister ran the 5K five minutes faster than the 5K she ran this past spring. Also my niece came in 3rd in her category for the 5K-Run/21K-Bike. Yesterday Sabine left a comment on my Blog asking what UP stands for. Well to answer your question UP is the way I sign all my emails to my nieces and nephews. It stands for Uncle P.
She also asked about my Blogs name MyTippy. 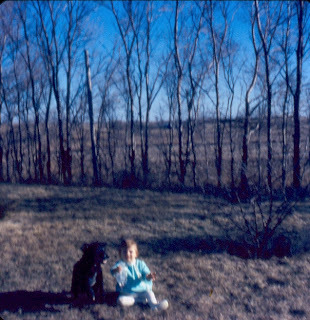 When we lived in western Kansas we adopted a stray dog. 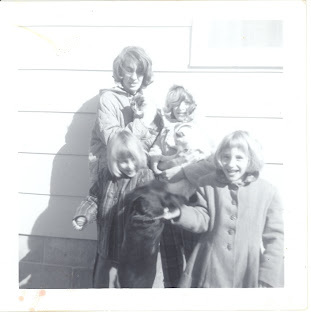 We had that dog for ten years and all nine of us loved him. Even ME of Those Northern Skies has had her photo taken with Tippy. 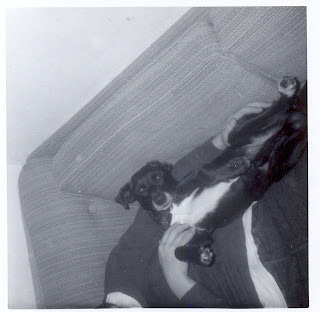 Because we all loved Tippy and because I have a lot of good memories of that time in my live I decided to name my Blog MyTippy. Now I thought I had more photos of Tippy but I can not find them. Oh well you might not want to look at them. However here is one more. Last year my sisters got together to run a 5K marathon. I mentioned that I would love to run with them. We decided that this year we would find a 5K somewhere and all of us would run it together. Last January at my uncle's funeral we were talking about how we only seem to see each other at funerals. So I decided that it was time to change that and have a family reunion. My aunt suggested we combine both functions and meet this Saturday. The town she lives in has a 5K-fund raiser for the local hospital. They also have a paint the town fund raiser where you pay to be able to paint a 3-foot square section of the town's main street. Well I thought that was a great idea and sent off an email to all my aunts, uncles, cousin, brothers, and sisters telling them that we would be having a family reunion this coming weekend. I think about 30 - 35 people will be coming. My sister, one brother and his family are all staying in a motel about 12 miles away from my aunts. Two of my sons and my other brother and family are camping. On Saturday Sister M. and I plan on doing the 5K. She will walk and I will ride my wheelchair. I know a couple others plan on doing the duathlon - 5K-run/21K-bike. Some are not planning on doing the marathon but are planning of painting the town. We will be using my Aunt D's house as "ground zero". Everyone is to bring snack, bars, cookies, whatever for during the day. My Uncle B. and Aunt C. are providing the hamburgers and hotdogs for Saturday supper. Aunt D. will provide plates, plastic ware, napkins, and baked beans. I know we are bringing a 4-bean salad and chocolate chip cookies. My sister M is making coleslaw. I have no idea what the others are bringing, some have told me but I've forgotten. Then on Sunday those who can stay overnight plan on descending on cousin L's church. Her husband is the pastor and we all thought it would be nice to hear him. However, his wife my cousin L. says there isn't room for that many visitors. We will have to see. After church we have arranged for the use of their fellowship hall and will have a lunch of sub sandwiches. I expect that everyone will be on their way home by 1:30 in the afternoon. Hopefully next week I will be able to tell you how this worked out. Today Britt-Arnhild in her The Blue Cafe writes about making changes to her food Blog. Instead of writing the recipe and the step by step explanation on how to make something she may just talk about food experiences. My Home Health nurse says that when she comes food is all we talk about. However in my defense she usually comes once a month so I have a month of saved up food experiences to talk about. I enjoy it when my family is home and they cook something special. Or just sitting in the kitchen watching P cook or bake something. Because I am in a wheelchair and can't exercise I've had to learn that the secret is to have a small portion of the goodness and then to talk about how good it is/was. Otherwise I would no longer fit in my wheelchair. I must admit that keeping my weight down is something I struggle with. So instead of attempting to make something, which usually leaves me exhausted, I read a number of food Blogs. However, getting back to the difficulties of writing step by step directions to follow reminded me of some recipes I've seen. After my father passed away we divided up my father's household things. A couple months after doing this, my youngest sister sent me some recipes she found in the back of a drawer in a chest my parents had in their kitchen. Here is one of my grandmother's recipes. Notice the directions on oven temperature and baking time. I also like the line "½ cup fat." PEANUT COOKIES – Grandma S.
Yesterday P helped daughter K move into an apartment in the city. K is doing a semester in the city for her Urban Studies minor. Because I would be home alone I decided to ask P's two nephews over to help me smoke a ham. Last week P purchased a 6 1/2-pound ham. 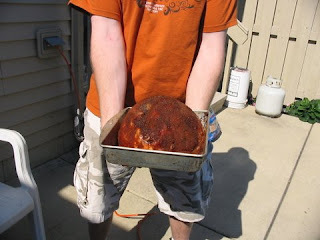 Sunday evening, I prepared and applied a dry rub on the ham. I followed the first smoked ham recipe on the Texas Barbecue website. Then Monday morning the nephews showed up at 10 A.M. We got the smoker uncovered, the hickory wood and charcoal started. By 10:30 the ham was on the smoker and the long wait started. We found a bottle of red wine I had forgotten I had and added it to the water pan. Once the ham was on the smoker we made the sauce for basting the ham and the glaze for glazing the ham during the last hour of smoking. The recipe called for basting the ham once an hour, but we decided to baste it every half-hour. We sat at the kitchen table and talked and talked. Every half-hour or so they would go check the temperature of the smoker. We had a terrible time keeping the temperature of the smoker low enough. However, as the day progressed we decided that the sun heating the top of the smoker caused the high reading. After lunch once the sun had moved and the smoker was in the shade the temp was right were we wanted it. For my birthday my son J had given me a remote read meat thermometer. So after lunch we sat in the den and watched some baseball games. The nephews took turn running out to baste the ham every half-hour. When the remoter thermometer read 155 we started applying the glaze. After applying the glaze every 15 minutes during the last hour the ham was on the smoker we removed it from the smoker, tented it with tin foil and placed it in the oven to stay warm while we prepared the rest of supper. It has been a long time since I've had a ham that was so tasty and juicy. I had thought that it might be dry and tough because of the long time it was smoking. However that wasn't the case. It was so tender you could cut it with your fork. 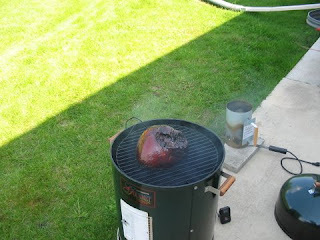 I also think the red wine added a nice flavor that complimented the hickory smoke. Maybe I will try smoking a turkey next time. If I do that I think I will use apple wood chips, wood chunks and apple cider in the water pan. Maybe P and I will do this late in September or early October.